Depending on how things go, the Lawrence Halprin-designed United Nations Plaza and fountain in San Francisco could soon be demolished. The brick-lined open space is punctuated by a jagged, sunken fountain made of rough-shorn granite blocks and is installed in the city’s Civic Center district, an area that is undergoing redevelopment as the city seeks to beautify and enliven existing pedestrian areas. Though not designed as a commemorative work, when it opened in 1975, the fountain was dedicated to the signing of the U.N. charter, an event that took place in the Veterans War Memorial Building near the site of the future fountain in 1945. The opening marked the 30th anniversary of the signing and originally heralded the fountain as a civic work of global significance. 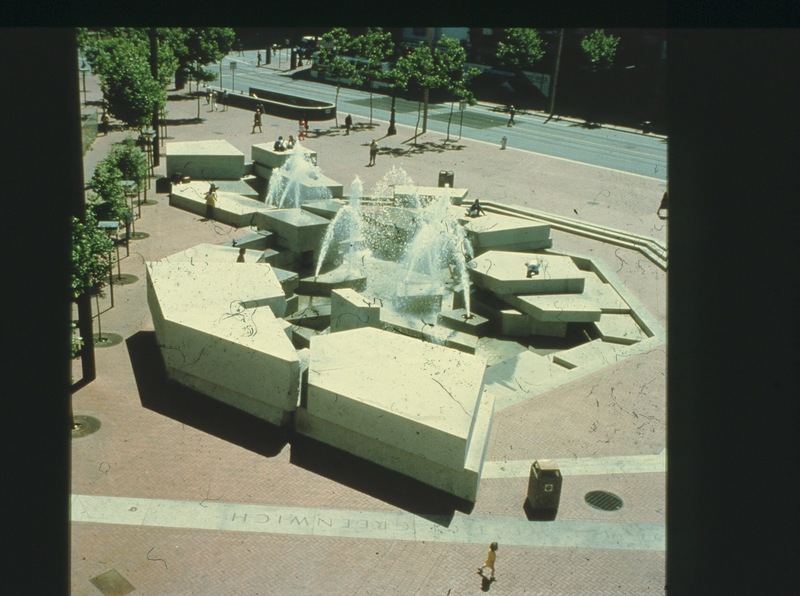 The fountain was designed by Halprin, who worked in concert with architects Mario Ciampi and John Carl Warnecke as part of an urban redevelopment scheme for the area. At Halprin’s office, Don Carter worked as principal-in-charge for the project with Angela Danadjieva—lead designer for Halprin’s Freeway Park in Seattle—as landscape architect. The fountain was designed starting in 1962 during Halprin’s Modernist period; when the fountain debuted 13 years later, it contained a futuristic set of features, including computerized spray nozzles that could detect strong winds and dial-down in power in response, as to not spray passersby with water. Art and Architecture reports that the high-tech, Sierra-inspired fountain also came with an artful tidal pool installation inspired by San Francisco’s tides that cycled every hour. Greenery, including large trees, originally surrounded the fountain, as well. The fountain was designed according to a concept called “motation,” a method for scoring how one’s perception of the environment changes depending on the speed and motion of the observer, according to The Cultural Landscape Foundation (TCLF). The fountain’s stacked blocks are carved with inscriptions and represent each of earth’s seven continents. The work, 165-feet long and articulated raucously as a set of stepped, interactive cascades, acts as a gateway connecting Market Street with the Asian Art Museum, the Orpheum Theater, a public library, and eventually, the Civic Center Plaza fronting City Hall. Today, the fountain is suffering from disrepair and neglect, with the tidal pools long-extinguished and most of the surrounding vegetation gone. The Civic Center BART and Muni station has recently come into the spotlight as open-air, intravenous drug use has become more prevalent within its corridors. Sandwiched between the city’s rapidly-gentrifying Tenderloin and South of Market districts, the areas above and within the station are often populated by people experiencing homelessness, a long-standing site condition that precedes even the 1975 renovations. The plaza spaces were “hardened” against this type of occupation in the early 2000s when all of the benches were removed and the fountain was briefly shut down. Starting in 2005, however, the plaza became home to a twice-weekly farmers market that continues to draw crowds. Plans are currently underway by CMG Landscape Architecture to redesign the plaza in tow with surrounding streets and open spaces as part of the Civic Center Public Realm Plan. The plan is managed by San Francisco’s planning department in conjunction with multiple local agencies and seeks to soften the area by promoting pedestrian use of the spaces surrounding San Francisco City Hall while repairing some of the planning mistakes of the past, like the lack of concessions and playgrounds in the area. The design team includes Gehl Studio, HR&A, InterEthnica, Kennerly Architecture + Planning, Lotus Water, Structus, M. Lee, JS Nolan, architecture + history, and HRA Engineering. CMG is currently soliciting public opinion on a trio of redevelopment proposals, only one of which retains the iconic fountain. The three proposals seek to redesign the space, with each presenting a different approach to shifting the overriding character of the three interlocking plaza spaces that make up the open space sequence between Market Street and City Hall. 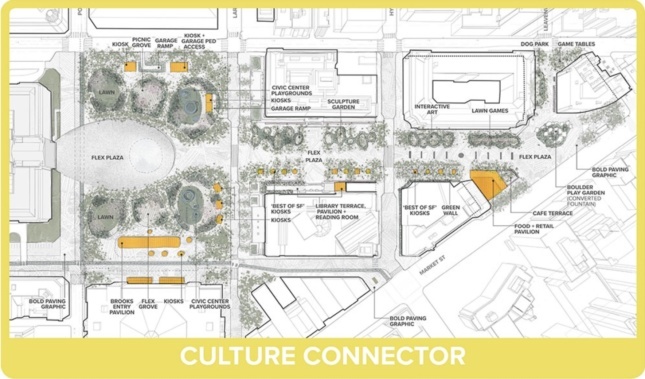 First, the “Culture Connector” plan aims to connect the three “flex” plazas with two runs of general-purpose open spaces lined with gridded street trees. The proposal would modify Halprin’s fountain in order to transform it into a kids’ bouldering playground. A pair of larger playgrounds would ring the Civic Center Plaza in the scheme, with collections of kiosks and pavilions scattering the site. 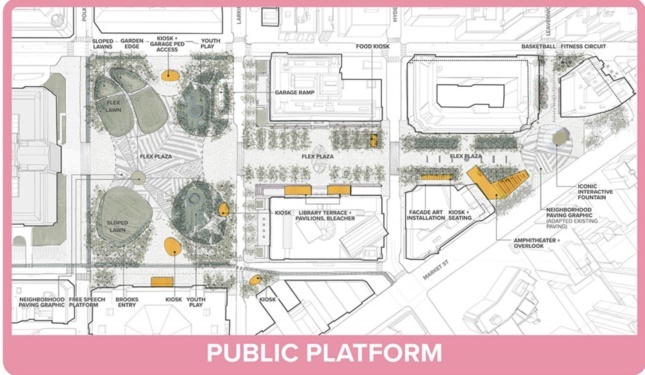 The “Public Platform” plan aims to resignify the plazas’ function as space for protest and political gatherings by creating a more open plaza at the fore of City Hall that will be flanked by lawns. Here, fewer trees would be present while new concessions structures are to be consolidated in larger buildings at key entry points to the main square. In this scheme, the plaza fountain would be replaced with a new interactive waterwork. 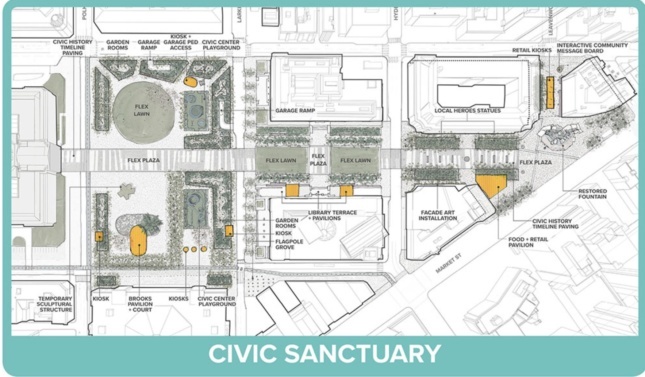 The “Civic Sanctuary” scheme proposes to reconfigure the plaza areas into lawns while garden rooms and a sculpture gardens ring other areas of the site. The scheme—geared toward preserving the historic elements of the plaza complex—would retain the water fountain, though plans call for removing some of the taller stone elements of the installation. The fast and loose proposals raise questions regarding the care—or lack thereof—being taken with the Halprin-designed fountain as plans are being made for the future of the UN Plaza and surrounding spaces. Charles Birnbaum, president and CEO of TCLF, described the fountain as having a “high degree of integrity” and as a “slam-dunk landscape architecture contribution for the National Register of Historic Places.” Birnbaum explained that planners are mistaken to casually call for the elimination of a piece of high civic art via a public opinion survey and that the work was among the most intact of Halprin’s surviving San Francisco works. The fountain is eligible for the National Register and is actually located in an existing historic district, but under a designation that does not include the 1970s-era changes to the area. As a result, efforts to hastily rework the Civic Center’s public spaces threaten to sacrifice one of San Francisco’s major civic art works in lieu of seemingly generic and temporary sculptures. Further, the salad bar approach presented in the schemes—individual elements of from each of the proposals are also up for consideration, allowing the schemes to be mixed and matched—leaves much to be desired for Birnbaum, who would rather see more thoughtful community engagement for the site. Halprin—the “father of public engagement” according to Birnbaum—was known for artful collaboration with clients and users in his efforts to find responsive approaches for his often-interactive works and landscapes. For now, San Francisco will continue to collect public input through the summer so that the design team can generate a singular proposal for formal consideration.